I'm back! I've been on vacation to Walt Disney World in Florida, but I'm back now and its time to catch up on a bunch of great infographics that have been sent in to me. First, I'll share this one from Disney. 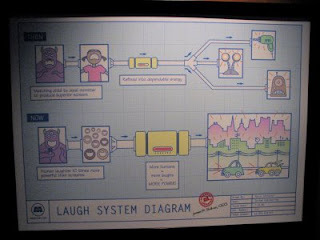 The Laugh System Diagram is from the queue area in the Monsters, Inc. Laugh Floor. I wish they sold it as a poster. It seems simple, but I was amazed watching a five year-old explain it in great detail to her parents. Of course, there are some inside connections too. The yellow car in the bottom right corner is the car from the animated short on the DVD "Mike's New Car". The Rush to Wind Farms!